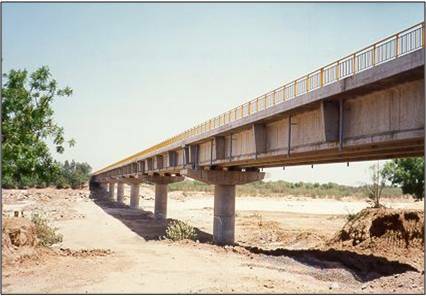 Bridge across river Watrak near Kheda, Gujarat on NH8 on the Ahmedabad – Vadodara National Highway, was set up under Build-Own-Operate-Transfer scheme. In addition to the high level bridge, this link consists of a one-way two-lane carriageway stretching for 9.2 km. L&T Infra Engineering is providing engineering services for the bridge and the approach roads. The scope of work involves providing Consultancy Services for Detailed Design of construction of a two lane bridge across river Watrak near Kheda, including 9.2 Km approach road and strengthening of NH-8. The Project consists of 42.2 M span pre-stressed concrete I-girders completely precast and launched in position over single circular piers on well foundations. The well for foundation was sunk by jacking down method. The work done included the complete design of bridge and cross drainage works along the 7 Km long approaches to the bridge and obtaining approval for the same from the owner’s consultants. The abutment is of spill through type of height 8m.